One of the most popular destinations for a beach getaway, Mexico boasts a vast selection of interactive tours and excursions. Having a general idea of the tour you’re most interested in beforehand is always a good idea to save time and make the most of your vacation. If you’re looking for some off-the-beaten-path adventures, below we’ve highlighted a list of Lomas Travel tours that are as unique as they are adventurous. Between June and September, this exciting excursion allows you to swim in the company of whale sharks in their natural habitat. No need to worry if it sounds a little too dangerous for your liking. The diets of these gentle creatures consist of plankton and small fish! This tour includes your transportation, bilingual guides, continental breakfast, lunch, snorkeling gear, non-alcoholic drinks, insurance, and taxes. Learn the history of one of Mexico’s oldest archeological sites located in the ancient Mayan city of Tulum. Stand in awe of these remarkable structures right along the Caribbean shoreline and then enjoy some time relaxing on the beach nearby. This tour takes approximately 1 hour and 30 minutes, including round-trip transportation, a bottle of water, bilingual guides, and sun lounges. The cobblestone streets and artisan shops of Plaza Playacar await you on this guided shopping trip to Playa Del Carmen’s famous 5th Avenue. Including a bilingual guide and roundtrip transportation, you’ll have a full three hours to experience the authentic Mexican culture that continues to be a highlight for many tourists. 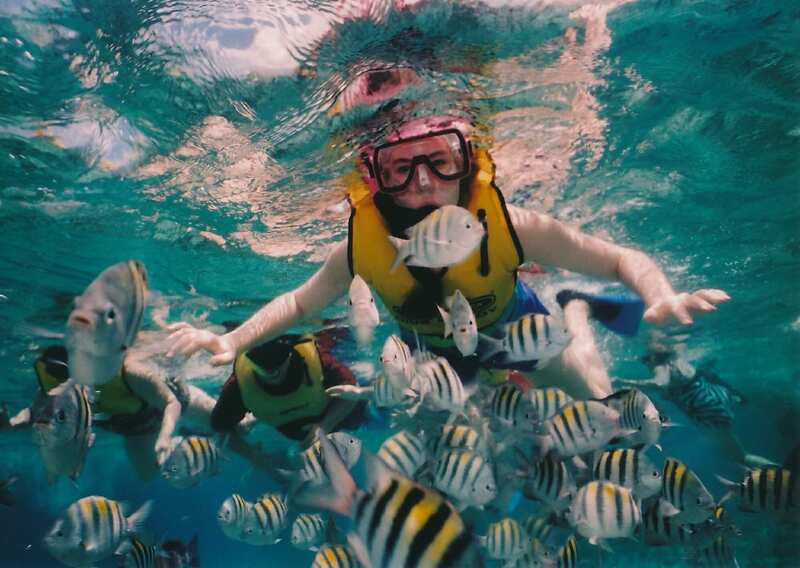 Just a short ferry ride from Playa Del Carmen, the beautiful island of Cozumel is famous for incredible snorkeling and scuba diving. Looking for something in between? Try snuba, an activity that combines components of both. Snuba allows you to explore much deeper depths than snorkeling due to the air tank that floats on the surface. We can’t think of a better way to see vibrant sea life without having to worry about PADI certifications! Otherwise known as natural sinkholes, cenotes offer a snorkeling experience that is unlike anything you’ll find in the open blue. Cenotes are full of cool, crystal clear water, housing very unique ecosystems (including the always-beautiful stalagmites and stalactites). Note: biodegradable sunscreen and bug spray is mandatory for preserving the cenote’s composition. Explore the Mayan Jungle and its lush vegetation by zip lining high above the trees! For this thrilling tour, you’ll want to wear light clothing and more importantly, bug spray. First timers are more than welcome as everyone will be prefaced with the zip lining basics and equipment involved prior to any activity. In our opinion, there’s truly no better place to sample an assortment of tequilas than Mexico. The tour begins with listening to the evolution of Mexican culture in the Discover Mexico Park and finishes with a tequila tasting. Did we mention that the tasting also includes tacos? If you’re anywhere near the Cancun area between May and September (which happens to be Sea Turtle nesting season), you can witness a miracle right on the beach! This tour begins at 10:00 p.m., as female turtles crawl out of the ocean to nest during the night. Don’t expect to capture the experience on camera, though. Flash photography will scare the turtle right back into the ocean before she even begins to lay her eggs. Famously known for its imitations and reproductions of world-known artists, this Coco Bongo tour provides a lively atmosphere for an unforgettable experience. With a duration of 7 hours total, booking this event includes free entry, unlimited bar, and transportation. Count us in! Take in the rugged landscape of Cozumel by dune buggy on this 4-hour tour. Following the coastal highway, you’ll pass crocodiles, lagoons, and even have the opportunity to view the scenery from a lighthouse. Up for some off-roading? Take advantage of the mud terrain area near the end of the route. And don’t forget, a valid driver’s license is mandatory! Comment with your go-to excursion in Mexico! With so many resorts to choose from, it’s easy to get overwhelmed by pictures, online reviews, and overall information overload. Get in touch with an Enchanted Honeymoons travel agent today about all-inclusive packages in Mexico! You can also reach us at 402-281-3022.